The point of the open-source UVM-UTest project we’ve been working on is to demonstrate how unit tests can be used to lock down the functionality of legacy code. Being able to run the unit tests means that when you’re changing code you can verify existing features won’t break during maintenance. We think that’s valuable. A nice side benefit of the project is that we can also show unit testing as being effective for increasing the quality of code hardware engineers write. How can we say that? 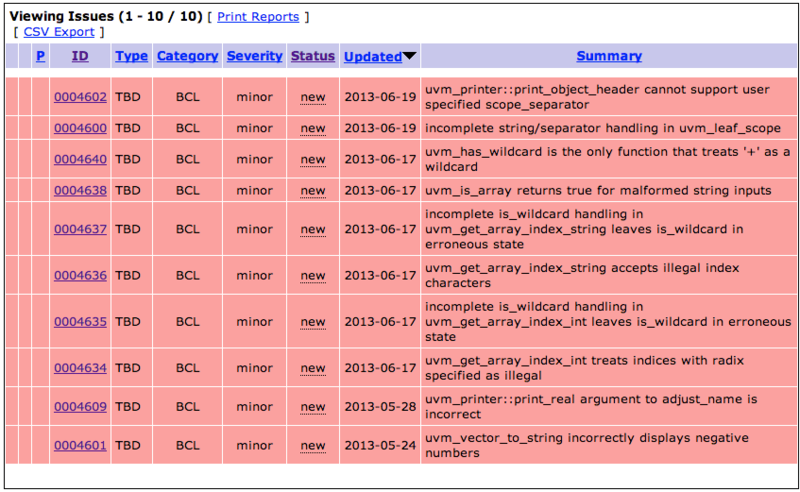 Because over a 5 week period we found 10 defects in the UVM 1.1d release. Here’s a snapshot of those defects. If you go to the eda.org mantis database, you can look at each of these reports in more detail. The project has been great for us so far and we’re glad we’ve made it open-source so others can see what we’ve done with it. To date, we’ve written roughly 430 unit tests. We’re still working on core functionality of the UVM. We’ve written unit tests for the uvm_object, uvm_printer, uvm_printer_knobs, uvm_scope_stack, uvm_status_container and global methods in the uvm_misc.svh. As I wrote in Are You Ready for the UVM-UTest Challenge? we’ve had colleagues challenge our testsuite. They found a few holes that we’ve since filled. We’ve attempted to lock down the UVM line-by-line. That means each of the unit tests we’ve written focus on 1 very (very) specific feature of the UVM. At times, it’s been difficult to work at that level of detail, but we’ve seen that it’s necessary to exhaustively verify code. Unit tests are a good mechanism for finding defects that other techniques haven’t detected. Admittedly, I don’t know much about the tests that are currently run against the UVM. By the class of defects we’ve found, however, I think it’s fairly evident that we’re working at a much finer granularity. Locking down code line-by-line has given us the opportunity to learn about and critique the UVM line-by-line; similar to how you’d do in a code review. It’s obvious by some of the defects we’ve found that there are features of the UVM that no one has ever used. Mantis 4602 is a good example of this type of flexibility: the uvm_printer offers the flexibility of user specified scope separators, however, due to a very basic incompatibility between the uvm_printer and uvm_scope_stack it’s not properly supported. Unit tests are great for exposing functionality that is incomplete, which is particularly critical for IP like UVM that’s intended to be used by many people and organizations. Mantis 4638 is an example of this. On the happy path, uvm_is_array will tell you whether or not a string is formatted as an array. If you’re a user that doesn’t always travel down the happy path, however, you can put in all kinds of poorly formatted input and the function will tell you you have an array. I’m sure there will be other lessons learned as we carry on. For now, I think the best way to summarize this project so far, regardless of what happens to it from here on, is that unit testing is a technique that hardware teams must consider adding to their development approach. If you’re familiar with the work that’s gone into UVM, you’ll know that it and it’s predecessors were developed cooperatively by a collection of very smart and recognizable people from relavent organizations – both product development and service organizations. And yet, we were able to find several basic defects in the framework over a short period of time. …but we don’t… and I think 10 defects in 5 weeks with UVM-UTest shows that nicely. This entry was posted in Functional Verification and tagged svunit, UVM, UVM-UTest. Bookmark the permalink. ← Are You Ready for the UVM-UTest Challenge? Unfortunately the big problem with UVM development right now isn’t finding bugs in the BCL, it is finding people willing to fix those bugs.